If you’re a regular reader of this blog, you know that my first book for teachers, REAL REVISION: AUTHORS’ STRATEGIES TO SHARE WITH STUDENT WRITERS, was released from Stenhouse this summer. I’m celebrating with a series of author interviews on the topic of real revision…the nitty gritty, make-the-book-better strategies that some of my favorite authors use when they’re revising a project. Since most of the author interviews in the book are with middle grade writers, I wanted to feature some authors of my favorite YA novels in this series. Jo Knowles is one of the smartest, kindest people I’ve ever met, and I loved her first two books, so I wasn’t surprised when this one crept quietly up and swept me away, too. This book keeps its secrets close to its heart, so I’m going to tell you only what I can without giving them away. Pearl Collatti has lived a pretty mundane life with her mom and grandfather, Gus. She hangs out with her best friend Henry and watches Days of Our Lives with his mom. But when Gus dies, family secrets fly like milkweed fluff in the wind, and everything is different – Pearl’s relationship with her mother, her friendship with Henry, and her image of the grandfather she thought she knew. 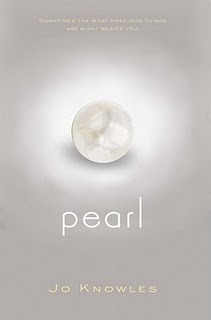 PEARL is so many things… it’s part family drama, part romance, and part mystery. It’s peopled with characters so rich, so beautifully imperfect, that it’s hard to believe they’re not real. It’s a book about the cost of keeping secrets, trouble that turns beautiful, and painful truths that make room for love. It is a book that believes in love, too…even after years have passed. This is one I’ll be thinking about for a long, long time – and a book that I think will be an amazing choice for teen book clubs and literature circles when it comes out this summer. write? Or all at once after you’ve finished a draft? All at once after I finish a draft. Many times while I’m writing a first draft I’m tempted to go back and revise, but I know if I keep doing that, I’ll never finish. Once I have a first draft, I like to use an outline to help me see the progression of the book. There’s a storyboard method I learned from Carolyn Coman that involves thinking of the strongest image and emotion of each chapter to help you see not only the way in which the action unfolds, but how emotion moves through the story as well. that ended up being cut? In the early stages of revision, I look at my storyboard and think carefully about what purpose each chapter serves and how it both deepens the story and moves it forward. If I can’t name it in a very clear way, it often gets chopped. In later stages, when I’m fine-tuning, I look at each paragraph within a chapter and ask myself what I’m trying to achieve and how it helps inform or move that particular chapter forward. If it doesn’t serve a clear purpose, I cut it. For me, this often comes in the first draft, when the characters tug at me strongest. In the revision process, I know them well enough to hone the personality traits I learned in the first, and I look carefully to make sure they’re consistent. But to be honest, characters nearly always come to me fully formed, and I don’t give a lot of thought to how I can make them more real, because in my head, they already are, and I just hope they feel the same to readers. The thing I struggled with most was how Bean and her mom could live with Gus but have such opposing feelings for him. How could Bean adore Gus while her mom clearly resented him so much? Wouldn’t one see at least a little of what the other saw? That was a real challenge, especially since at the opening of the book, he’s already dead, which meant that any scenes with Gus had to be flashbacks, which are so hard to do successfully. I think when revising ANY book, you have to be willing to make hard changes. In writing, you have to know the difference between gut feelings and stubbornness. There are two things you need to be willing to do: Go to the hard places to find the real truth, and be able to let go of whatever doesn’t lead you there. Thanks for sharing your revision stories, Jo! And for everyone else…I really loved PEARL. You won’t want to miss it. Thank you very much for the wonderful interview. Thank you Jo for the excellent advice. So glad it was helpful – thanks! And the to read list grows! Loved, loved Lessons from a Dead Girl and Jumping Off Swings. Thanks for the great advice on revising…esp…be willing to make the hard changes. I struggle with that some.